The announcer’s voice stopped soft chatter outside East Lansing’s Amtrak station as the Friday morning train pulled up to the platform. Passengers destined for a long weekend in Chicago, or points in between, rolled their luggage to the open coach doors. Conductors in dress uniform waved them aboard. Within 10 minutes, the train was moving again, en route to Battle Creek. Marla Schroeder planned to meet a friend from Kentucky in Chicago. She has taken the train to and from East Lansing since she was in high school. Schroeder, of Lansing, would rather spend the trip leafing through a book than navigating heavy traffic. “It’s cost-effective, because by the time you drive in and pay the gas and the tolls and the parking, the ticket is free,” she said. Schroeder doesn’t need to be convinced to travel by rail. But even as ridership in Michigan has tracked upward in recent years, Amtrak, the sole national passenger rail line, is looking for more. The Washington-based railroad and the state plan to invest millions over the next several years to improve service on Michigan’s three passenger train lines. For a fee, riders now can stow their bicycles on board some trains. Internet service is coming in January. And, upgraded tracks between Kalamazoo and Dearborn will allow trains to travel at higher speeds, leading to shorter trips. 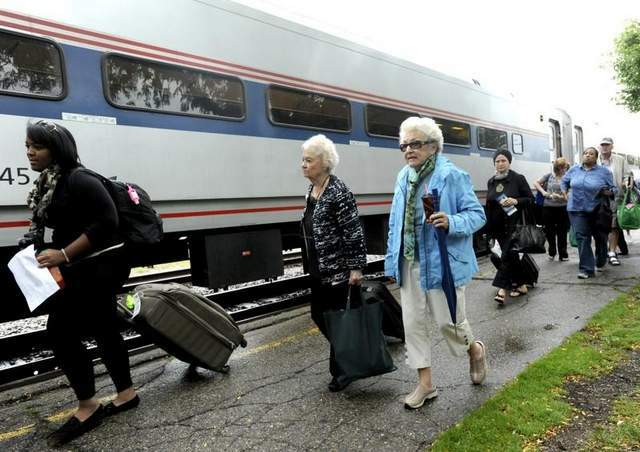 While travelers might find the new amenities appealing, Amtrak and the state of Michigan have a more basic financial goal: Boost ridership and fare revenue so the subsidies the state has been paying since the 1970s drop. The strategy becomes more important this year because federal legislation approved five years ago requires Michigan to pick up the tab for the third route it hadn’t subsidized — the Wolverine line between Pontiac and Chicago that counts Detroit, Ann Arbor, Jackson, Battle Creek and Kalamazoo among its stops. Michigan for decades has underwritten the Blue Water line between Port Huron and Chicago — a route that includes the popular stop in East Lansing — and the Pere Marquette between Grand Rapids and Chicago. But the federal law that took effect last week shifted the cost of the Wolverine and other previously federally funded routes to the states in part to bring more uniformity to the way the nation’s passenger rail service is funded. For Michigan, that means taxpayers will pay more than $25 million for the fiscal year that started Tuesday to operate the three lines — more than triple the roughly $8 million they have been paying the past few years to offset losses on the Blue Water and Pere Marquette routes. For some, the solution might be not to pay. But with nearly 800,000 riders in Michigan last year, it’s not that simple. After all, the federal government doesn’t require the states to provide passenger rail service the way it mandates, for example, that some cities must have airline service. “If we don’t pay for any Amtrak service … we have no Amtrak service,” said Tim Hoeffner, the state’s rail director. But banking on millions of dollars in improvements also won’t lead to a quick payoff. The state — and taxpayers — still will end up backing Amtrak for the foreseeable future. The railroad projected $2.9 billion in nationwide revenue for 2013 in a May budget request. It asked Congress for $2.6 billion in the current fiscal year. To do that, Hoeffner said, traveling to Chicago by train needs to be as convenient as driving — if not more so. A road trip from East Lansing to Chicago can take about four hours — or less, depending on traffic and weather. Amtrak’s online schedules say a direct trip by train is exactly four hours. But because there is only one direct round trip on the Blue Water line each day that departs before 9 a.m., travelers who want to leave later end up taking a commuter bus to the Battle Creek or Kalamazoo stations and connecting on the Wolverine line to Chicago. That means a longer trip. To be sure, a four-hour drive to Chicago is not guaranteed — traffic is notoriously heavy in and around the nation’s third-largest city. But Amtrak also is hindered by delays. Its Michigan routes were on schedule just 38 percent of the time in the past year, with most of the delays the result of interference from other trains on freight-owned tracks. To entice passengers to consider rail, Amtrak opened up space for bicycle storage on its Blue Water line. Packing a bike costs a passenger an extra $10. The Michigan Department of Transportation will spend about $1 million to bring Wi-Fi technology to all three of Amtrak’s lines by January, which will be a free service for riders. The state and Amtrak believe the investment will be recouped after the first year because more people will choose the train — they can’t browse the Internet while driving — although it can’t say how many more riders Amtrak would need to break even. Perhaps most important in its competition with the car, Hoeffner said, MDOT and Amtrak are working to upgrade a section of state-owned track between Kalamazoo and Dearborn with new signals and smoother rails in order to push trains up to 110 mph. Most passenger trains through Michigan travel at a top speed of 80 mph. Amtrak owns a 100-mile stretch of track between Kalamazoo and Porter, Ind., 80 miles of which already can handle higher-speed trains. It’s the only place outside of the Northeast where the faster trains run. The state believes this will most benefit passengers who ride from Pontiac and Detroit to Chicago, a trip that can take as long as 6½ hours by train. The drive typically is about two hours shorter. MDOT bought the Kalamazoo-to-Dearborn section in December from Norfolk, Va.-based freight operator Norfolk Southern Corp. for $140 million. It received close to $350 million in federal funds to buy and improve the track and will contribute $37.5 million in state funds. Work already has started this year. Upgraded service, however, doesn’t come free. Since the 1990s, the state has steadily paid more to Amtrak out of a general transportation fund, even though more people are boarding its trains. Ridership reached a high of nearly 793,000 passengers in 2012, the same year MDOT funding topped $8 million. In 1994, by comparison, Amtrak carried more than 589,000 passengers and MDOT paid just $965,000 — $1.5 million when adjusted for inflation. MDOT’s current subsidy amounts to about half of Amtrak’s total revenue for its Michigan service, Hoeffner said. None of the state’s three Amtrak routes are profitable. In a report issued in March, the Brookings Institution, an independent policy research firm based in the nation’s capital, found that Amtrak’s shortest-distance routes made up 80 percent of the railroad’s total ridership in 2012. But those same routes — those under 400 miles, a group that includes the Blue Water, Pere Marquette and Wolverine lines — also relied heavily on state aid. Together, funding from states cut their collective operating loss in 2011 by more than half, to $166.1 million. Congress formed Amtrak in the 1970s after freight companies, which also provided passenger service, began to drop routes to avoid bankruptcy or otherwise cut their costs. Federal and state governments began to subsidize passenger rail service that same decade because revenue from riders wasn’t proving enough to cover its costs. MDOT contracts with Amtrak to provide passenger service in Michigan. The state has supported the Blue Water and Pere Marquette lines since they were formed in 1974 and 1984, respectively. Until last week, the Wolverine line that passes through Detroit en route to Chicago had been federally funded. But the 2008 federal law that just went into effect created requires states to pick up any operating losses not covered by riders on specific routes outside of the Northeast that are shorter than 750 miles. Amtrak spokesman Marc Magliari said passenger rail service is an economic boost for communities that have stations. Government funding of Amtrak is no different than funding of roads, he said, adding that road maintenance relies partly on gasoline taxes that are insufficient to pay for the total operation. Amtrak runs three routes through Michigan to Chicago — the Blue Water, which departs from Port Huron; the Pere Marquette, which leaves from Grand Rapids; and the Wolverine, which starts in Pontiac and passes through Detroit. Below, the amount of the Michigan Department of Transportation has contributed to run Amtrak service in Michigan. Below, ridership counts from selected stations on the three lines.